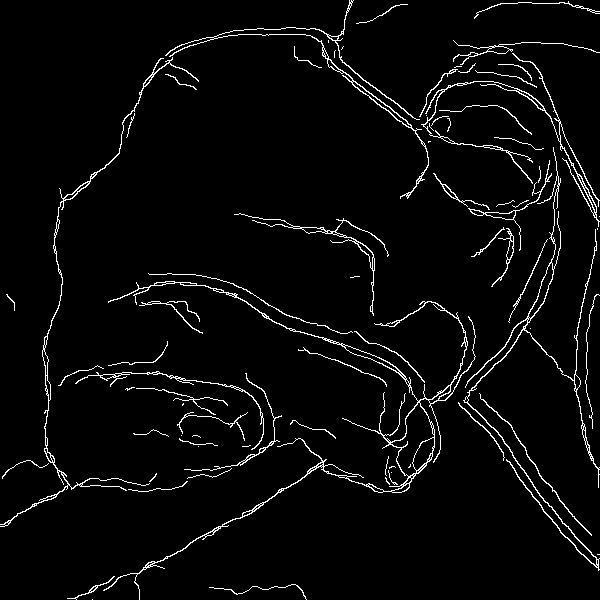 An image may contain broken lines. It might be a scan from an old book, or the result of processing a photograph, or a hand-drawn sketch. A variety of methods can identify and fix these breaks. We will consider only white lines on black backrounds. They may be aliased. We assume the image is fully opaque. We create source images to demonstrate techniques. 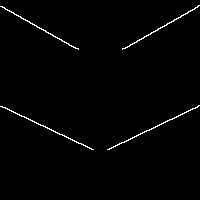 Each image contains broken lines, with a large gap or a small gap. We will repair the small gaps, leaving the large gaps unchanged. In the first four images, we will join line-ends together. The following contains broken T-junctions. We will mend the small gap. ASIDE: The methods shown will join lines from line-ends. 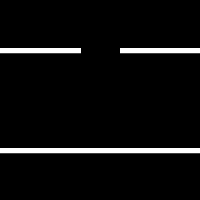 When two lines are in close proximity, but line-ends are distant, the methods will not join them. Such cases can be joined by "-morphology Close", though this will also join line-ends. The methods use sketelonized versions of the inputs, and coordinates of the line-ends of the skeletons. 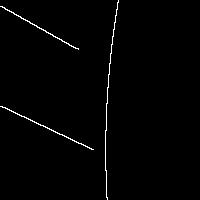 We can get an approximate line width by dividing the mean lightness of the input image by the mean lightness of the skeleton image. We make a script skelPS.bat that makes a skeleton, prunes stubs, and finds the ends. Two of the methods join lines-ends that are within a threshold distance of each other. How do we find the pairs of line-ends that are to be joined? ... where i,j range from zero to (N-1), where N is the number of line-ends. Then we are interested only in the pairs where the distance is less than or equal to a given threshold. In our worked examples, we will use a proximity threshold of 20 pixels. The script pointsDist.bat finds those pairs of points, writing the output in a format usable by -draw "@file.txt". This can be done in a shell script, however it takes O(N2) time. If we have millions of line-ends, this is a problem. Ignore line-ends that are not close to any other line-end. Loop through the line-ends in a compiled language. 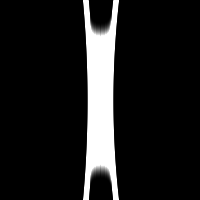 For every line-end, make a copy image that has this line-end painted black, and all pixels beyond the threshold distance painted black. Combine all the results from (1), taking the lightest pixels from each. 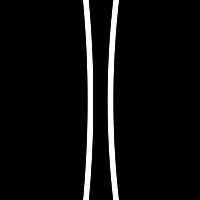 The result is white where a line-end is close to another line-end; otherwise black. Although this algorithm is not O(N2), it is O(N*W*H), so is likely to be just as slow in practice. 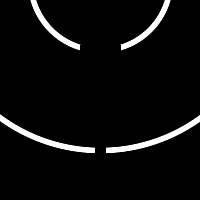 For each line-end, make a square crop, "radius"=proximity_threshold. Flood-fill the crop from the centre to turn the line black. If the result is entirely black, this line-end is not near any others. Otherwise, it is near at least one other line-end. For each of those line-ends: if the Pythagorean distance is within the threshold, add a line to join the line-ends. This improved algorithm is O(r2*N), where r is the "radius". It can use either the image of the line-ends (to find line-ends that are near each other), or the initial input image (to find line-ends that are near lines). This implemented as pointsRdx.bat. The script has a large overhead per line-end, but is massively quicker then pointsDist.bat when we have hundreds of line-ends. 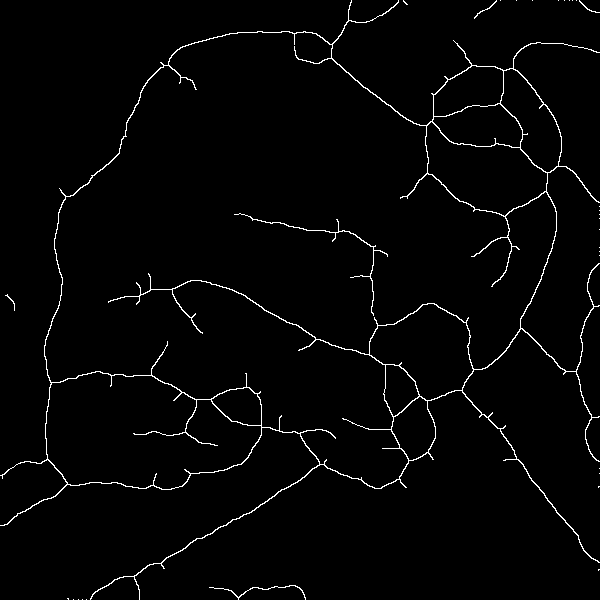 pointsDist.bat calculates the distance from each line-end to every other line-end. 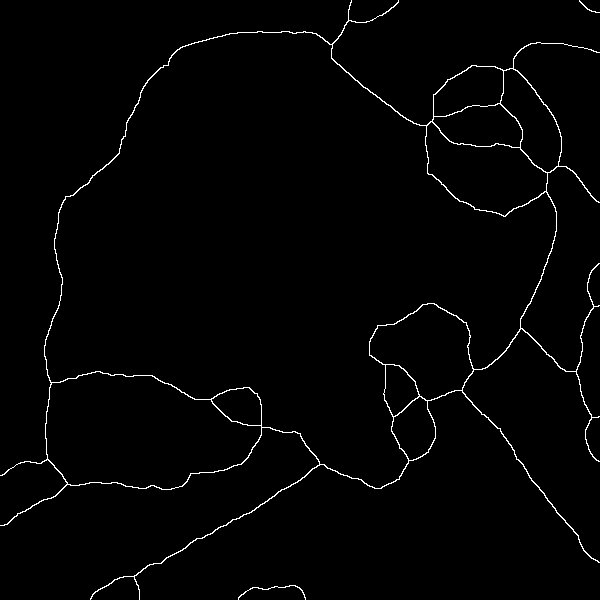 pointsRdx.bat calculates the distance from each line-end to only the near-by line-ends. Join line-ends that are in close proximity. Basic method: find distance between every pair of points. Better: first, eliminate points that are not in proximity to any others. Do it in C.
When we know which pairs of line-ends are close enough to be joined, we can join them with a simple thin white line. As we know the average stroke-width of the input image, we can use that as the width of the added line. We put this into a script, proxLineEnds.bat.  Note that this method, like the others, doesn't notice that a pair of line-ends may be the two ends of the same short line, and hence already joined. We can "grow" lines. That is, we can extend them. 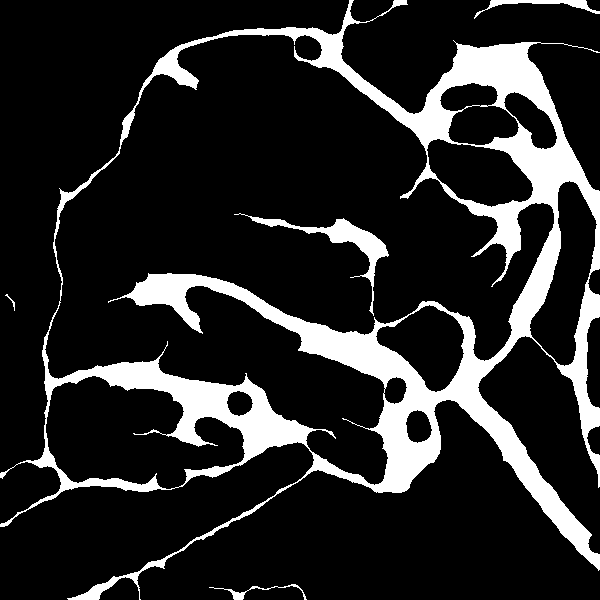 One method is to erase (make transparent) background pixels around line-ends, then fill in these holes. These extensions can be used as a mask, so an extension is used only where another line-end (or another extension) falls within this exension. We could operate on one line-end at a time, extending it by a certain radius. We would then compare the results pair-wise. Where two results have white pixels in the same location, then we know the intersection is caused by an extension. This would raise a difficult problem: How do we know how far to extend lines? We find that two extensions intersect, but we don't want either line to be extended beyond the intersection. Intead, we erase (make transparent) all the black pixels that are within a circle centered at the mid-point between line-ends. Then we fill all the holes, in priority order. The radius of the circles should be half the proximity threshold, and the window_radius is set to the estimated line thickness. We put this into a script, extLineEnds.bat. Instead of erasing a circle, we could erase a square or other shape. This could improve performance when we want to mend large breaks where the broken ends point directly towards each other. The script extLineEnds.bat does the job, but doesn't recognise when it has failed. In the second example above, it has extended a pair of parallel lines, and they don't intersect.  Similarly, if the two lines approached each other at a small angle, nearly parallel, the intersection would fall outside the circle (or square). So the lines would be correctly extended, but they wouldn't meet. The process could be repeated until they did meet. Creating holes then filling them has a problem. The cloning might come from any pixels that are within the search radius. Ideally, we would clone only from the relevant lines. The script could be modified to skeletonize the result and test whether any line-ends were present in the relevant crops of the result. If they were, it could roll-back those crops, so lines that don't intersect are not extended. [[We can detect when this situation has occurred: find any line-ends in the area defined by the circle (or square) of the result.  If there are two or more line-ends, the situation has probably occurred, so repeat the process with these new line-ends. The methods above join line-ends that are close to each other. We can also handle situations where a line-end is close to another line, but not necessarily an end of that line. Crop a square of the required "radius", centred on that line-end. 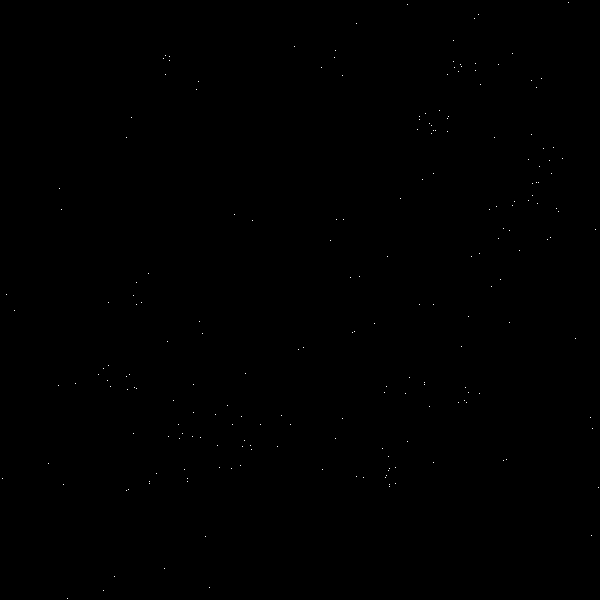 If there are no white pixels, do no more with this crop. Otherwise, we need to draw a line on the input image between the line-end and the point that corresponds to the found white pixel. The flood-fill is needed to prevent a line-end from trivially joining with itself, or the next point along the line, etc. However, when a line ends with a U-shape, we might want the end to join with the pixel on the other branch of the 'U'. If the other branch is connected to the line-end within the crop, this algorithm won't join with it. In the first four examples, the script has added two lines, because the line that is close to a line-end has, itself, a line-end. 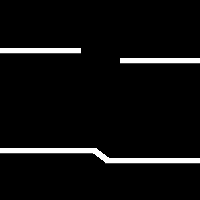 So a line is added from a line-end to the second line, then another line is added from the second line-end back to the first line. To prevent this from happening, first process the image with a method that joins line-ends together. If the unbroken line doesn't have a line-end here, the added line segment will be perpendicular to the unbroken line, more or less. We might instead use Hough lines, within just the crop, to identify the intersection point (with the caution that the intersection might be outside the crop). If we want to close gaps at the edge of the image, we can add a white border, run TjuncLineEnds.bat, then shave off the added border. FUTURE: TjuncLineEnds.bat is painfully slow. It probably needs a cut-down version of nearCoast.bat. The script combLineEnds.bat combines some of the above methods. They are run in sequence: the output of one method is used as the input to the next, recalculating line-ends for each method. This simple script uses the same threshold for each method. In practice, different thresholds may be preferred. The "Z" in the second example is caused by extLineEnds.bat creating an overshoot, then proxLineEnds.bat joining them. FIXME: we need width before the prune. For some purposes, we want to simplify the image, and the original lines are unimportant. Then a simple (and fast) command may be appropriate. Unlike the methods shown above, -morphology close will merge parallel lines that are less then 2*r apart. This may be good or bad, depending on the application. A blink comparison shows the difference. The image mbl_morphcl.png can be regarded as a thick partition boundary mask. When a number of line-ends are in close proximity to each other, the methods will join them with new lines from every line-end to every other line-end, which is more than necessary and looks ugly. For example, five points that are close together will generate 12 lines joining them. This could be solved by re-calculating line-ends after every join, but performance would be terrible. Perhaps we could extract crops, add each line to the crop, and re-calculate just for the crop. 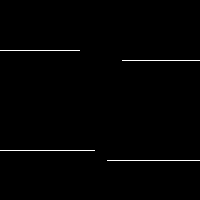 A method for mending a broken T-junction by extending the line should be possible. I would like a method for the minimal joining of lines that are in close proximity, as shown in the Aside above. Of course, we can "-morphology close" and skeletonize, but how do we get an "H" shape? What size of gap should be closed? This is a parameter the user must supply, and the same number is used in all parts of the image. There is scope for automatically determining this number. Three methods for mending broken lines have been shown. They can be combined, but not with the same line-end data. Instead, they should be run in sequence: the output of one method can be used as the input to another, recalculating line-ends. rem makes output %2 skeletonised with short stubs removed. @rem   XYZ.png       skeletonised image, pruned. @rem   XYZ_ends.csv  list of the line-ends. :: Calculate approx line width. rem   finds all pairs of points that are less than or equal to the given threshold. if !DO_IT!==1 echo line !X0!,!Y0! !X1!,!Y1! rem outputs %3 text file containing pairs of points that are close. rem %4 is proximity threshold. @rem Output file may be empty (returns prdxNUM_PNTS=0). :: Note: When a line is short, its two line-ends are close, so will be joined. rem joining line-ends that are within proximity threshold %3. @rem   skelLineEnds if 1, skeletonises the output. @rem   threshLineEnds if 1, thresholds the output at 50%. rem by extending pairs of line-ends that are within proximity threshold %3 of each other. rem   skelLineEnds if 1, skeletonises the output. rem FIXME: more than the line width? set sLINWID=-stroke Black -linewidth !wider! echo %0: with holes sSKEL="%sSKEL%"
rem by joining line-ends with other lines that are within proximity threshold %3. rem echo %0: ncCST_X=!ncCST_X! ncCST_Y=!ncCST_Y! echo line !LE_X!,!LE_Y! !ML_X!,!ML_Y! >>!LINE_SCR! rem combining methods, each with proximity threshold %3.  rem centred on mid-points of coordinate-pairs from %1. Source file for this web page is mendbrkln.h1. To re-create this web page, run "procH1 mendbrkln".